no event is complete without the sweets! Nothing is sweeter than the magic of your wedding day. 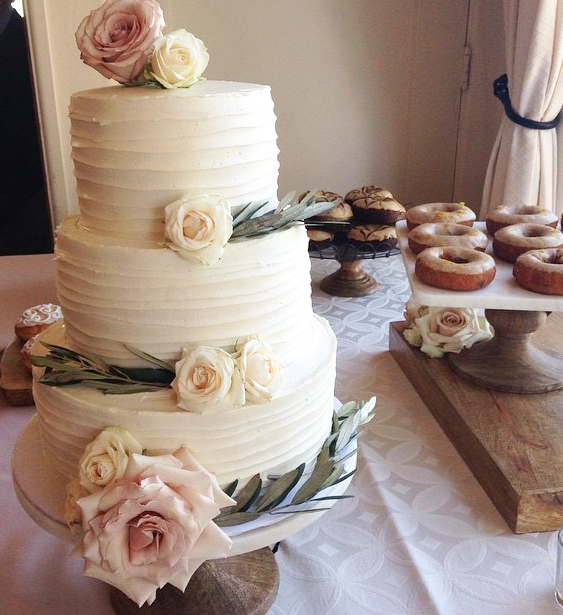 Whether you are having an intimate gathering or black-tie affair, let us bake and sculpt your dream dessert table! A cake for any occasion, or no occasion at all! Your wish is our command. We'll work with you to execute your cake vision, or provide you with some inspiration of our own! Top of any event with a display of delicious treats! The sky is the limit, no sweet idea is too big or too small. Let us shower your event with bite-sized pieces of heaven! Every cake, cupcake, cookie and dessert bar item is crafted by hand under the direction of Food Network stars Maeve Rochford, Ray Vizcaino and Manuel Miranda within 24 hours of your event. We NEVER FREEZE our cakes or cupcakes. All items are made with Buchmann local eggs, Finlandia Butter, local produce and the highest quality chocolate. No shortening is used in any of our products. All cakes include sprinkles, custom messaging and an embossed cake pad. The following prices are for house buttercream cakes only. For fondant and custom cakes, please contact us via the form below. Rentals and Displays vary from $15 (glass & chrome) to $250 (china & Waterford crystal) with a non-refundable rental fee. Delivery price is based on Location and Staffing requirements (average $60-250). Cake Pickup is 8am-3pm daily. Early Pickup from 7am- 8am and After-Hours Pickup from 3pm-4pm is also available for an additional $35. Fondant Cakes & Custom Cookies: Ordering, cancellation and/or change requests must be made 7 business days in advance of pickup date. House Cakes: Ordering or cancellation must be made 3 business days in advance of pickup date. Weddings & Catering: Cancellation must be made 90 days in advance of pickup date for a 50% refund of the deposit. Payment is required in full 30 days ahead of event date. Please review our calendar prior to placing your order. I was born and raised in El Paso, TX my entire life by my mother, grandmother, grandfather, and aunts. I come from a family of six children and with a single working mom, I had helped a lot with the chores, cooking, and cleaning. I enjoyed watching both my grandmother and aunt bake and cook. That was one thing I truly enjoyed about my family was that food always brought us together. It wasn’t until I graduated high school and joined the United States Marine Corps that I was brought out here to San Diego. I was stationed at Camp Pendleton where I served my entire enlistment. I deployed three times and got to travel the world and meet amazing people. I knew once I got out that I wanted to continue that journey in life and bring people together with food, so I enrolled into the Art Institute of California San Diego and started my baking journey. I always was a creative and artistic child growing up and that helped me a lot in the kitchen especially when it came to decorating and I took to it very well.